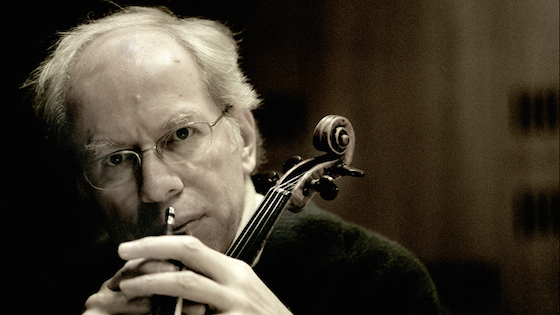 Gidon Kremer performed Bartók's Violin Concerto No. 1 with the San Francisco Symphony. San Francisco Classical Voice: "In Kremer's interpretation, the music flowed inexorably but with a light touch. No matter how technically difficult the score may be, Kremer's violin sang with a seamless legato characteristic of only the greatest singers. He consistently shaped the melodic line perfectly." The San Francisco Chronicle: "The evening’s biggest disappointment...came at the midpoint, with Gidon Kremer’s brusque and awkwardly unsentimental solo turn in Bartók’s Violin Concerto No. 1. Written by the young composer as an avowal of love for violinist Stefi Geyer, the concerto can be full of endearingly youthful passion, as it was in 2006 when Lisa Batiashvili was the soloist with the orchestra. Kremer was having none of that. Instead, he charted a rhythmically harsh and often ill-tuned course through Bartók’s score, one that all too rarely caught the romantic ardor beneath the notes. No wonder Geyer turned Bartók down." Examiner.com: "While Kremer kept his body language minimal, his account of those contrasts could not have been more vivid; and Boreyko could not have served him better with ensemble support....this was a performance that prioritized the music itself, allowing the listener to grasp and appreciate even the slightest of gestures that Bartók had tucked away in this highly personal score." Leila Josefowicz performed Adams' Scheherazade.2 with the London Symphony Orchestra. The Guardian: "In the Barbican, it took a while for the LSO to realise that they were not the centre of attention and that Josefowicz’s wonderfully committed and ferociously intense playing (from memory!) was. But once they had, the balance between orchestra and soloist was much more convincing." Music OMH: "It is certainly a moving work, and the violinist, Leila Josefowicz (for whom the work was written) addressed the virtuoso requirements of the part with outstanding brilliance, but, ultimately it was a challenging piece to listen to. This modern-day Scheherazade is rightly very angry – she inspires sympathy and admiration; we understand her anger and agree with it, but it does not make her loveable in any way, and the fistfuls of notes ripped from the violin attest to this. The Independent: "Now in her full maturity, ex-prodigy Josefowicz is a virtuoso of the old school, and the sheer beauty of her concluding flight cast a redeeming aura over all that had gone before." Gil Shaham performed works by Bach accompanying David Michalek's film "Bach Six Solos." The New York Times: "(Michalek's film) is the tepid stuff of advertisements for blood pressure medication, not a worthy partner for Bach. Mr. Shaham deserved better: He built in intensity through the long performance, his tempos brisk but never rushed....He delivered the seething, sprawling Chaconne from the D minor Partita with evocative changeability..."
Renaud Capuçon performed the Mendelssohn with the Los Angeles Philharmonic. Los Angeles Times: "Renaud Capuçon managed to make the inescapable concerto fit the occasion by finding a way for predictable music to sound not only unpredictable but also risky. The French violinist's tone is slender, and he glided through the score with tremendous speed and agility but also with considerable refinement, treating the solo part as tightrope act. That combination can keep a listener on the edge of his or her seat." Pekka Kuusisto performed the Nielsen with the Scottish Chamber Orchestra. The Guardian: "Nielsen was a folk fiddler and Kuusisto made it show in the gorgeous looseness of his rhythms and stripped-back grit of his sound. There’s not an inch of formality to his playing: he might as well have wandered the hall and whispered, crooned and stomped directly into our ears. His encore was a pair of traditional polskas, full of spry ornamentation and raucous swing. What a thrill." The Scotsman: "Kuusisto’s personality shone through from the opening Bach-inspired flourishes, through to the macabre, dance-infused finale." Edinburgh Guide: "The Finnish violinist Pekka Kuusisto is a delight to watch. An astonishing virtuoso violinist he played Carl Nielsen’s Violin concerto to perfection." Frederieke Saeijs performed the Knussen with the Britten Sinfonia. Music OMH: "Young Dutch soloist Frederieke Saeijs did full justice to the work, playing it without a score and, after a string snapped in the final movement, swiftly swapping violins with the orchestra’s leader, Jacqueline Shave." The Telegraph: "Amid these fascinating sonorities, it makes virtuosic demands, and here the warm-toned Dutch violinist Frederieke Saeijs trod the tightrope brilliantly, not even missing a beat when she broke a string and quickly exchanged violins with the leader." Arabella Steinbacher performed the Brahms with the Philharmonia. The Guardian: "Her immaculate tone suited its extended lyricism perfectly, though the high technical finish of her playing never came at the expense of emotional truth. Skilfully partnered by Salonen and the orchestra, she gave many individual phrases space to breathe while digging deep into the more vehement passages." Evening Standard: "The programme’s centrepiece was Brahms’s Violin Concerto, given a performance of unshowy virtuosity by Arabella Steinbacher. Her 1710 Stradivarius has a lovely, clean tone, whether singing sweetly or huskily; while other players may find more flash, her lack of exaggeration, even in the storming finale, paid dividends." Patricia Kopatchinskaja performed the Larcher with the London Philharmonic Orchestra. The Independent: "Kopatchinskaja dominated the second movement with everything from broad, double-stopped melodies to stratospheric yelps and glissandi..."
Or maybe "Different Strokes for Different Folks"? Boy do I ever enjoy these review compilations. Keep 'em coming!